Searching for fresh ways to entertain this summer? Look no further than these 15 Pinterest-approved summer decorating trends for the latest and most exciting inspiration! Edible flowers are an easy way to make any dish look beautiful and gourmet. We've seen them on pizza, sandwiches, salads–you name it! We particularly love this unbelievably easy wildflower and arugula salad with orange blossom vinaigrette and farmer's cheese. This Scandinavian deck is totally idyllic, and we love the pretty white upholstery. Who decided outdoor seating had to be uncomfortable? Treat yourself and your guests to a comfy evening outside with plenty of pillows and blankets to snuggle up with–just be sure to store them safely away from the elements! Crafting and gardening collide! Nature-inspired embroidery patterns are huge right now. Bring some leafy flora into your home without the stress of taking care of it. Head east from classic American sauces and pair your grilled fare with spicy Mediterranean and Middle Eastern flavors. Tzatziki, harissa and hummus are all delicious BBQ options for upping your outdoor entertainment game this summer. Forget millennial pink, orange is the next big color trend. Stay ahead of the curve by dressing up your home this summer in shades of tangerine and terra cotta. Go subtle or go bold, but you can't go wrong! Here's a cooking trend we're super excited about. You know the classics: smoked salmon, smoked brisket, smoked gouda. But try onion rings, mac and cheese, or this mouth water smoked rosemary oil dirty martini. Sick of stone pavers and rotting wood? 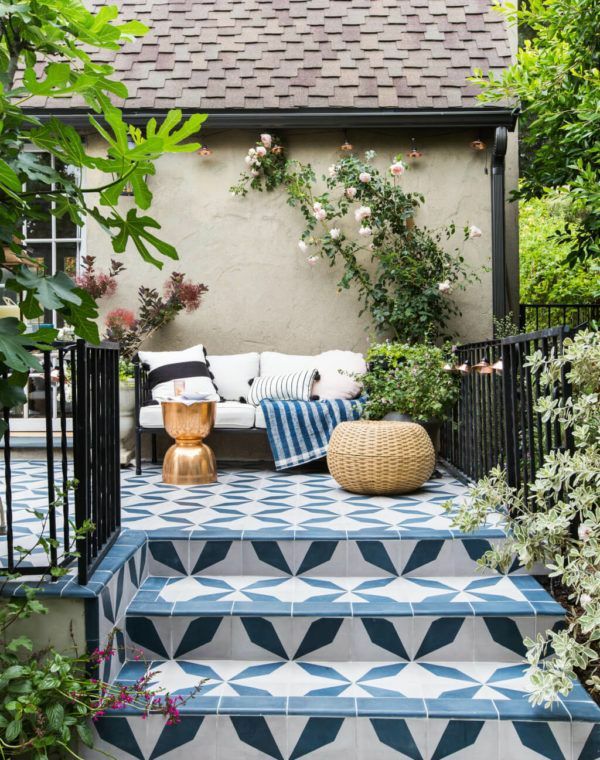 Patterned outdoor tiling is a great way to instantly add pizzazz to a tired outdoor space. We love how the pink touches in the cushioning offset the neutral grays and whites of the tile pattern. Ice has never been prettier or more flavorful. Decorative ice cubes are easy to make and a fresh way to spice up any cold beverage. Try freezing cocktail garnishes, edible flowers or anything you can think of–get creative! If you love keeping succulents, you might want to try your hand at raising aloe vera. It's not just pretty to look at: it's an air purifier, produces gel for natural burn remedies and makes a delicious addition to smoothie recipes! Expand your outdoor entertaining with a chic and inviting front yard! Pretty porches are making a comeback this summer–and we can totally see why. Just imagine sipping a lemonade in a comfy chair on this stunning and shady veranda. People are getting creative with their indoor gardening, according to Pinterest. We've seen all sorts of crazy ideas for plant potters, but simple tin can gardening is our favorite. These miniature hanging gardens are adorable and totally DIY-able. Cut down on the carbs and accommodate your gluten-shy guests with a bunless BBQ. Toss your pickings in a buddha bowl with your favorite grain for a healthy grilling alternative. Dealing with a small outdoor space? Sick of your kids tearing up the grass? Pretty patio pavers may be your solution. This trend is great for anyone who lives in a dry area where maintaining a lawn can be costly. Go totally waste-free by using melon rinds as a serving bowl. Upcycling fruit is a great way to present your platters and save the environment at the same time. Try watermelon rinds, coconut shells and more for anything from smoothie bowls to fruity cocktails! Outdoor kitchens are always in style, but if you live in a colder region or if you're a decorator on a budget, a big outdoor living area isn't necessarily an option. We love this idea for a potting bench as a bar table–it's cute, affordable and perfect for winter storage.